It can be difficult to shop for a car. Some days you need cargo space, some days you need passenger space, some days you need both. In some cases, it makes sense to have a large car; in other cases, you want something more compact. How are you supposed to check off all of your wants and needs with a single vehicle? Easy—you buy a 2019 Honda Civic. 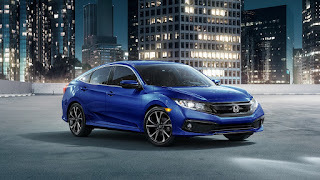 According to Kelley Blue Book®, “Offered as a sedan, coupe or hatchback and with varying horsepower, the 2019 Honda Civic may be the most versatile compact on the planet.” When drivers head into Keyes Honda to test drive the 2019 Honda Civic, they feel like their eyes are playing tricks on them. Outside, they see a compact car. Then they step inside to find far more passenger space and cargo room than they were expecting. They also find a car that’s highly adaptable, with a 60/40 split fold-down rear seatback and versatile storage options throughout. The 2019 Honda Civic is built to keep up with you while you’re running the week’s errands. It’s also got the sportiness you need to cut loose when the errands are done. All three models—the coupe, the sedan, and the hatchback—feature a fully independent suspension and available turbocharged engines. A redesigned front end gives the 2019 Honda Civic a more athletic look than ever before. One of the best things the 2019 Honda Civic has going for it is that it’s a Honda Civic. This consistently cool compact car has long been a standard-bearer for the automotive industry, showing what expert automotive engineering can achieve. And here at our dealership near Glendale, CA, the Honda Civic has been a driver favorite since we first opened our doors, known for its performance and long-term reliability. That’s why pre-owned Honda Civic models are such a popular choice for drivers looking to save money without sacrificing quality. Whether you’re in the market for something brand-new or something new to you, head into Keyes Honda today for a test drive.